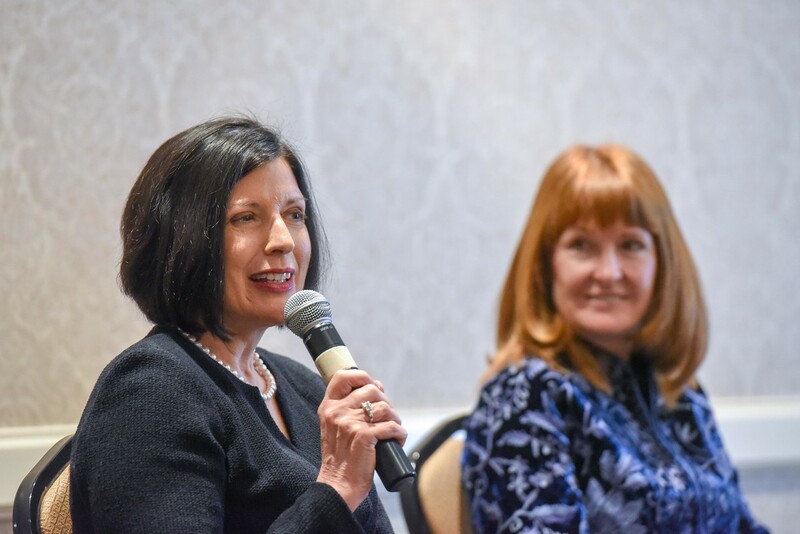 Cindy Baier and Jan Babiak's panel discussion of Diverse Perspectives, Better Decisions during the Kennedy Center for Business Ethic breakfast at Belmont University in Nashville, Tennessee, February 18, 2019. The Edward C. Kennedy Center for Business Ethics recently hosted a panel discussion titled “Diverse Perspectives, Better Decisions” featuring Cindy Baier, CEO of Brookdale Living, and Jan Babiak, an independent board director for Walgreens Boots Alliance and Bank of Montreal, among others. Dr. Jose Gonzalez from the Jack C. Massey College of Business was the panel moderator. More than 80 Middle Tennessee business Leaders attended the breakfast, and 60 students attended the convocation which followed. The central topic was the strengthened decision making found on public company boards that have at least 30 percent women directors. The benefit highlighted by increased diversity and inclusion was stronger business ethical decisions resulting from having diverse perspectives among board members. The panelists agreed that that are many qualified women prepared to serve in the corporate director role. They also discussed the pros and cons of California’s recent law mandating a quota for women directors on corporate boards. Baier and Babiak agreed that the decision to have a diverse board must be intentional and led by the Board Chair and CEO. It was noted that more board diversity will further accelerate the advancement of senior level women managers to executive management positions, hastening the breaking of the glass ceiling.